During National Lutheran Schools Week, students across the United States learned about life in Cambodia and the work of Lutheran Hour Ministries in reaching people with the love of Jesus. At St. John Lutheran School in Indianapolis, students participated in LHM’s online mission trip to Cambodia. Through an interactive website, students learned about the geography, culture and customs of Cambodia while gaining insight into global mission and ministry. In addition to the online mission trip, students dressed in Cambodian flag colors for one of their spirit days and collected donations for Lutheran ministries in Cambodia. 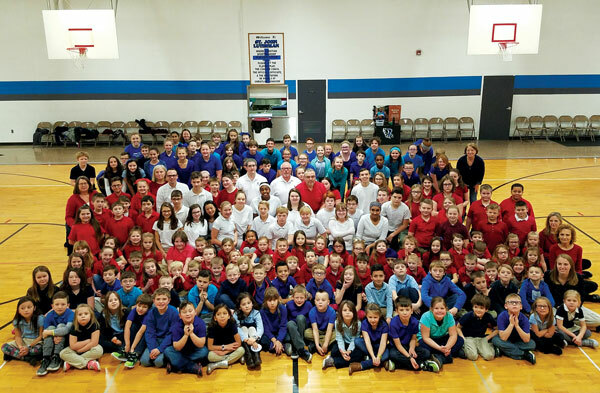 This collaboration between school and ministry is a valuable part of Lutheran education. Reverend John Stube of Ascension Lutheran Church and School in Fort Wayne leads chapel four mornings a week. For pastors, it’s a chance to connect with students who are members and those who are not. By teaching the “vocabulary of worship,” students become comfortable with the standing, sitting and prayer time during the worship service. In addition, Ascension also created an admissions policy where nonmember families are required to attend the pastor’s adult class in order to enroll their children the following year. Over ten to twelve weeks, parents get exposed to teachings on the Lord’s Supper, baptism and how it is that people, by God’s grace, come to faith. Although not all families become members of Ascension, they have a better understanding of the beliefs and importance of membership. Pastor Thomas Eggold from Emmanuel Lutheran Church in Fort Wayne says that one of the biggest challenges his school faces is helping everyone feel part of the community. Their school is a split campus between two age groups: kindergarten through third grade meet at St. Michael’s campus while grades four through eight meet at Emmanuel’s campus. Forty percent of the students are part of St. Michael, while forty percent attend Emmanuel. Twenty percent are not members of either church. In recent years there has been more interest in the school from non-Christian families, including Muslims and those of other faith backgrounds. These students, he notes, are still required to attend chapel because it’s an important part of their Lutheran school experience. “We see it as an opportunity to truly witness in a way that we don’t usually have the chance to do,” Pastor Eggold adds.